SKU: . Categories: Pacdog Remote Dog Training, PAC DXT SYSTEMS, Pacdog dog training systems. Tag: DXT. 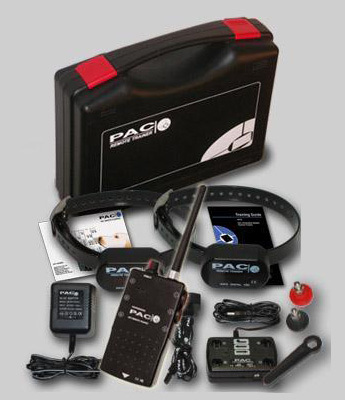 PAC’s DXT Advanced digital FSK range consists of 5 models capable of controlling between one and six dogs. Buttons enable either a tone warning, short or continuous stimulus from each one, or combining the features in Professional Mode. The DXT is a highly ruggedised model, capable of increased range and a unique modular design, enabling an upgrade from lower models in the same range. Up to 4 days continuous use from high capacity, rechargeable batteries. The collar electronics are enclosed in an extremely tough, watertight plastic housing that also conceals a highly sensitive internal antenna, all ruggedised to withstand the most demanding environment. All collars in the series have a ‘tone’ warning. Two stimulation modes are available: the very humane ‘momentary'(twin-pulse) tickle, and the more urgent, ‘continuous’ pulsing. Combinations of these, together with tone, can be assigned simply to the various trigger buttons to allow the user to select the ideal control for his dog. Options that cater for most situations are pre-set before delivery.